Migrating commercial and apartment buildings across to the NBN isn’t that difficult, you simply just need to know what the steps involved are, and potential impact for the business and tenants of the buildings should you not be ready in time. Getting your building lift emergency phone lines ready for the NBN prior to the actual cutover date is something you’ll need to consider months in advance. Reasons you’ll want to be pre-emptive during this stage is because things take time and can get a little messy should you not be organized. For instance, you may need to call a general meeting and find yourself an NBN lift phone provider which may have impact. TIP: Once your area or building is deemed ‘Ready for Service’ (RFS) you do in fact still have 18 months before NBN will make a full disconnection on your emergency lift phone services. Why do we need to appoint an NBN Lift Phone Provider anyway? It is a requirement by regulation that all emergency lift phones are functional during power interruptions. 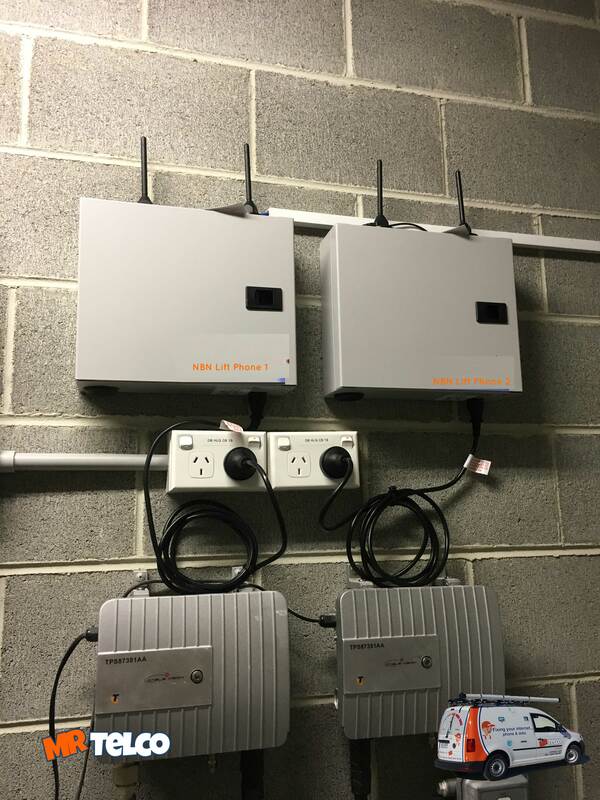 Telstra’s current PSTN network provides suffice battery backup from the Exchanges where your telephone lines currently originate from, thus you don’t need to look for alternate solutions. 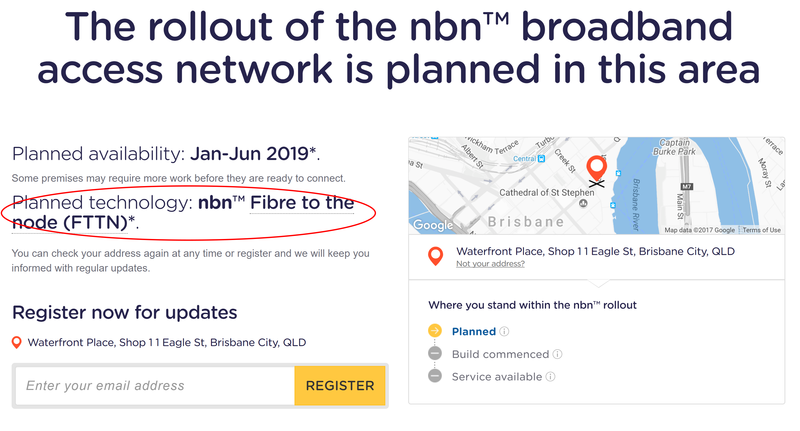 Moving across to the NBN your building will likely be supplied internet and phone technologies using FTTB or FTTN (both are exactly the same except the locations for the equipment are either in a basement of your building or on the street curb). Although this equipment DOES have back-up power, there may be an odd chance that the equipment doesn’t hold power due to in building power issues or even environmental conditions may impact the emergency lift phone function. Register your lift emergency lines and phones numbers on NBN’s website (click here). Find a suitable lift phone company (if you want recommendations, please ask us as Mr Telco installs these lift backup lines on behalf of reputable lift phone companies). Once you’ve found a suitable lift phone service provider, hold a general meeting or discussion on costs and solutions for your building/apartment block. The most common emergency lift line solution for overcoming the power back up issue presented with the NBN rollout actually one that is called a 3G or 4G dual sim backup solution. These are separate devices that are installed within your building and have a redundant alternate sim card installed. By using 4G sim card emergency lift phone solutions you are completely bypassing NBN’s network thus a more resilient solution. Below I’ll include an image of an NBN lift phone solution that one of Mr Telco’s technicians have installed for a Lift Phone Providers that we work alongside. 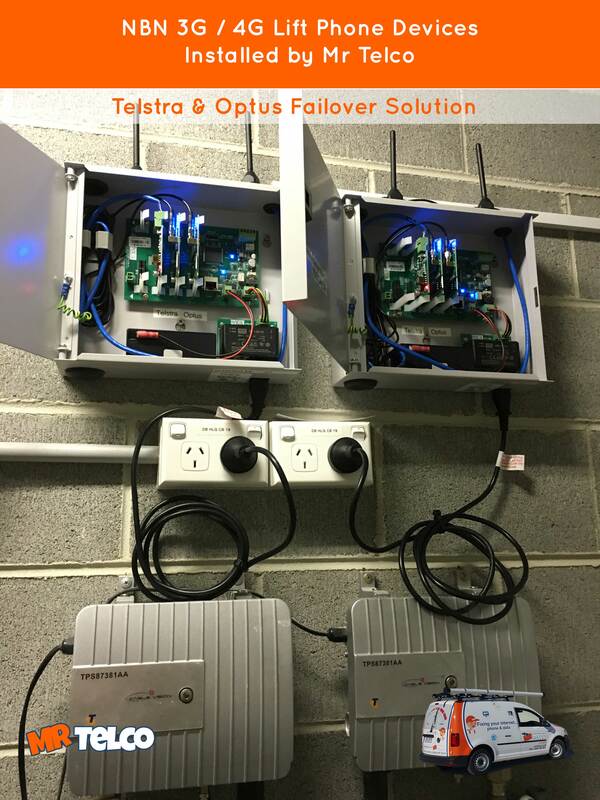 IMAGE: NBN Lift Phone Device 3G/4G with dual Telstra & Optus SIM card failover solution. I hope this article has been informative for you, and should you have any questions regarding your emergency lift phone line requirements we are more than happy to lend a hand or recommendation, just e-mail help@mrtelco.com or use our contact us form on this page and one of our technical specialists will be in contact to answer any questions. Need an emergency lift phone for your building?